Unmanned aircraft is a fast growing segment of aviation. Remote aerial photography used for weddings or real estate videos, line patrol, surveillance, agriculture and conservation are just a few of trades that are successfully broadening their business with UAV/UAS use. But with this growth comes an increased risk of liability. Unfortunately, there has been no simple way to get liability insurance for your drone…until now. Previously, operators of smaller UAVs like those used for aerial photography, have had to fill out volumes of paperwork before obtaining a UAV insurance quote. Now thanks to the ingenuity of the aviation insurance agents at Aviation Insurance Resources (AIR), there is a quick and easy way to apply for drone liability insurance! As the UAV and UAS industry grows, AIR will keep abreast of the latest industry developments and operator needs, making sure you are properly insured for the future. To learn more about unmanned aircraft insurance through AIR, please call us at 877-247-7769 or download our UAV and UAS application today! You can also follow us on Facebook, Twitter, LinkedIn, and Google+. The Aircraft Owners and Pilot Association (AOPA) is hosting aviation fly-ins around the country to meet its members and to join pilots and aviation enthusiasts together. All the fun kicked off on May 16th at Salinas Municipal Airport. The second event of the year will be this Saturday, June 6th at Frederick Municipal Airport in Frederick, MD. The event takes off at 6:30pm on Friday with a barnstormers party featuring a screening of the documentary “Living in the Age of Airplanes”. A pancake breakfast and a Rusty Pilots Seminar are set for Saturday morning. The event continues with a day of aircraft exhibits and free seminars. At 2:45pm AOPA president, Mark Baker, will conduct a Pilot Town Hall meeting followed by an ice cream social. The event closes at 4pm. 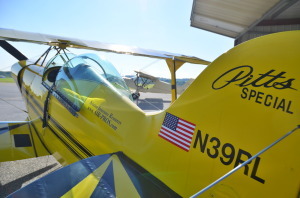 The aircraft insurance specialists at Aviation Insurance Resources (AIR) will have AIR President Jon Harden’s yellow and black Pitts S1S Biplane on display. Aviation plays an important role in the lives of the agents and pilots at AIR and those in the Frederick Home Office spend many a day flying (and hangar flying) out at KFDK. AIR provides a full range of aircraft insurance and aviation insurance products to clients of all sizes. AIR represents all of the major insurance markets and offers the broadest package of protection and the best available rates. To learn more about the Aviation Insurance Resources, please call 877-247-7767 or visit AIR-PROS.com today and receive an aircraft insurance quote! You can also follow AIR on Facebook, Twitter, LinkedIn, and Google+.